To read more about Jennifer’s journey (from rags to… well, nicer dish towels), click on each subject title to display text and photos. 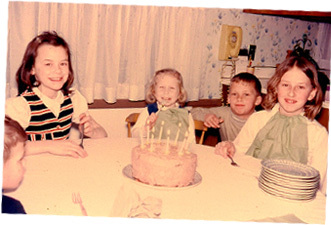 Circa 1966: That’s me on the right, on my eighth birthday. I “helped” my mom bake the cake. Fun stuff! My mom rolled her own puff pastry dough for croissants, baked her own bread, and made most everything from scratch. I joined her in the kitchen early on, and cooking became second nature. By the time I was 10, I’d compiled my first construction paper cookbook, which I gave to mom for Mother’s Day. My baking efforts were successful—relatives told me I should start my own pie-making business. As a teen, while friends enjoyed romance novels, I read up on yoga and nutrition. With low energy due to an undiagnosed thyroid condition, I tried various diets: vegetarian, macrobiotic, high-protein, low fat… This was before the internet, so my research was limited, and my approach to health was often misguided. Married to my husband Tom at age 17, I took my Betty Crocker Cookbook with me on our 5-week honeymoon, scouring it for recipes as we traveled across the country in an old van. We fancied ourselves opening our own restaurant someday. After our cross-country trip, I waitressed in our little town of Rochester, just outside of Detroit. 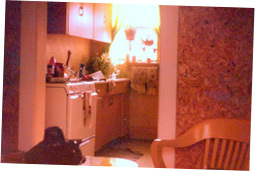 A bit of urban homesteading helped us survive on our paltry paychecks. I began canning our organic, home-grown tomatoes, pickling cucumbers, sprouting alfalfa seeds, dehydrating fruits, and culturing yogurt. 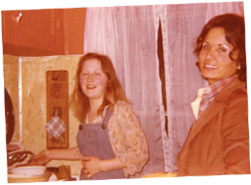 I learned the ropes of the food industry through various jobs; at home I cooked up a storm in my spare time. 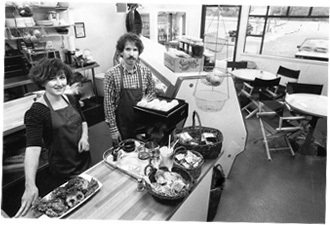 A friend encouraged me to take over a small, local vegetarian burrito business in 1982. 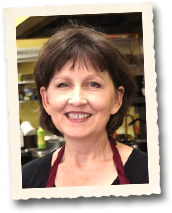 It was a cottage industry indeed; I made hundreds of burritos, sandwiches, and salads daily in my “cottage,” delivering to health food stores in the Bay Area. We were intent on providing locals with a new style of delicatessen food that included more vegetarian fare and plenty of homemade soups and salad dressings from scratch. So it seemed appropriate to call ourselves “The New Deli.” In 1985 in Pinole, this style of food did seem “new”! Tom helped run the café, doing everything except the cooking. He delivered wholesale sandwiches, kept the books, and maintained supplies. Within a few years, we were raising two boys as well. Our sons grew up at the café, crafting forts from boxes and decorating the back room with art drawn on sandwich paper. Always one to create wholesome menu items, I offered food at the café that our family would want to eat too. We ate well. Since 1985, we’ve been making New Deli recipes from scratch economically, using wholesome ingredients. I’m keen on streamlining methods–no labor-intensive, Martha-Stewart-style recipes here! It’s a great business model; making things from scratch allows deli staff to be productive (there’s always something to do). We continue making and serving delicious meals to local patrons, and I continue with my vision: To encourage others in taking steps toward healthier cooking. In the process, family and friends are well-fed, and memories are created. Yes, I am a born-again believer in Jesus Christ. He saved me! God has been working in my life even when I was working against it. I seemed consumed with a poet’s angst from an early age, becoming a rebellious teen, at odds with society. I sought counsel from the I Ching and Eastern religion, trying to control my life through various disciplines, yet never gaining any peace. 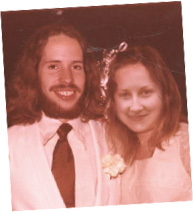 At age 38, I began to hear the gospel message of God’s love. I was transformed. I left behind an old life and finally became happy where I was at. God was in control and had a plan for my life. Now, I hope to share the love I’ve received. I feel truly blessed, and eternally grateful. For years, we saved 5-gallon buckets of veggie scraps daily at The New Deli, adding that to a compost pile in our home garden, where twenty-some fruit and nut trees flourish. When our community started collecting food waste from local businesses (also for composting), I was thrilled to pass the baton. I still have a compost pile, just not as big! I walk or roller-blade to work; The New Deli is three minutes away, on foot. My grandkids call me “Coco”. Our oldest grandson couldn’t say “Grandma Cote” when he was a toddler, so he started calling me Coco, and it has stuck! But how did this happen? Tom has other talents. Music’s been a focal point; according to Tom, he “played in several unsuccessful bands”. It was fun while it lasted. 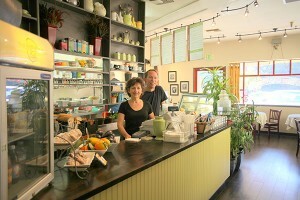 College degrees, corporate life, and white collar work never enticed Tom and Jen to join the ranks of most successful folk, but Jen’s intriguing start-up (“The New Deli”) inspired them to contribute to the community in a unique way. Going on thirty-plus years at this cafe, the man of few words continues on, inexplicably blessed.